It wasn’t a resolution as such but since the New Year I have been trying to empty out from the basement at least one black bin bag of rubbish each weekend. I managed two bin bags today and four or five weeks after first starting I am still coming across empty plastic cups left over from one or other of the kids parties that have been had down. If there are any surprises it has been perhaps the lack of empty vodka bottles. 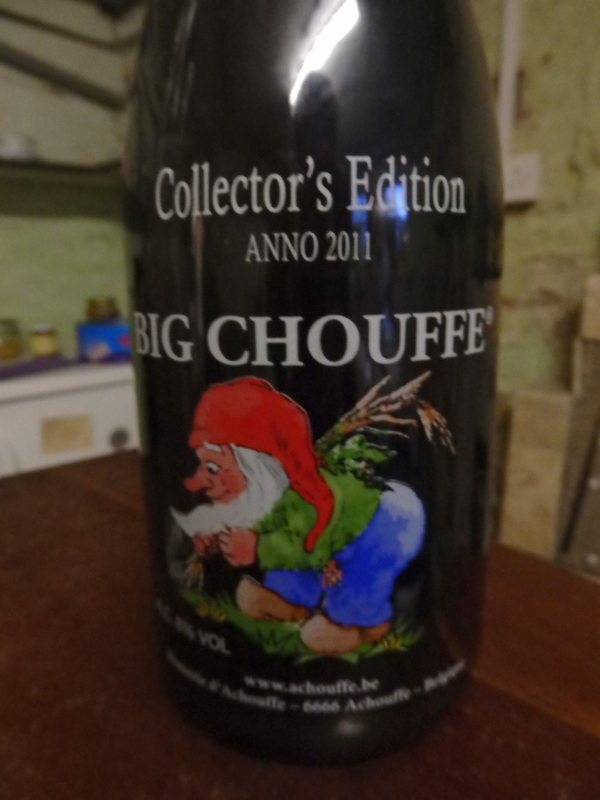 What I did come across was a grand bottle of Collector’s Edition 2011 Big Chouffe. Having found it I was expecting it to be a few years past its use by date but I was in luck – consume by the end of 2014. Well if it has been in the bottle for four years a couple of months extra is not going to make too much difference. It seemed like a good excuse to make it a beer themed day. There has been a book on Belgium cooking lurking round the house for a year or so now and I have still not cooked anything from it. Here was a good opportunity to make a beef stew with beer. Two pounds of stewing steak cut up into bite sized chunks dredged through some flour and then fried in plenty of butter. Once the beef was browned it was put to one side and I fried off some chopped onions in the same pan scraping away the brown residue of flour on the bottom of the pan so it didn’t burn. For beer I had been hoping to pick up some Leffe Brune but all they had was the Blonde so that was pressed into service. As the onions started to brown the beer was poured in and beef returned the pan. Once it was bubbling nicely I turned it down to a simmer and there it has been for the last hour so. Shortly before eating it I will stir in a table spoon of red wine vinegar and some red currant jelly. We should have it with chips but it will be roast potatoes instead. Whilst the stew was bubbling away I made up another forty pints of beer and that it now sat in the basement and should be ready in three weeks time. We have been listening to Pylon – nervy dancey early 1980’s New Wave from Athens, Georgia. Nothing to do with beer. There is news from the eldest daughter doing a course in Art & Critical Practice at Brighton University. She had a lecture this week on David Bowie and were made to listen all the way through “Heroes”. It wasn’t like that doing law at Warwick. I clearly slipped off the path somewhere. In an effort to get back on the path I have been digging up old records and we have spent this evening listening to the first side of an album by The Radar Bros. called The Singing Hatchet. As best I recall the second side is not as good. Later we will listen to some sparse Townes Van Zandt. And for food we are having a squid stew with potatoes. The squid came from Wards this morning. As I bought it Simon told me he had been cleaning squid all morning so I reassured him I would do the cleaning myself. I have said it before but it is worth repeating there are few better ways of keeping a fishmonger happy than offering to clean your own squid. It is a messy black handed job. But that was okay as I wanted some of the ink and the skin from the squid to stick so as to add a bit more flavour to the stew. I have I think talked before about the umami flavours that can be extracted from slow cooked squid. All those flavours are brought on if you keep with it some of the ink and the skin. There has been talk of Chinese New Year and so when I came home this evening there was a white plastic bag full of what was needed for a good stir fry. The woks were retrieved from the basement and given a wipe down. I have a total of three woks and I must have had two of them for at least twenty five perhaps thirty years. They are probably some of the best preserved bits of kitchen equipment I have working better now than the day I got them. They are both black and thick with use. The contents of the white plastic bag had come from The International Store, including the chicken – three obscene breasts which looked as if they might have come from an ostrich as opposed to a chicken. Two of them were chopped up and mixed with some egg and corn-flour. I then chopped up finely red peppers and carrots, ginger, garlic and spring onions. Before starting on the cooking proper I deep fried the prawn crackers and tofu. Both woks then went on to full burn and we started on the cooking. The chicken went into one and a mixture of red peppers and carrots into the other. As they cooked some of the red pepper and carrot was shifted and stirred into the chicken, the tofu was then added to the red pepper and carrot in the first wok and the garlic, ginger and spring onion was stirred into both. There was a large jar of black bean sauce to hand. Dark soy sauce was stirred in followed by dollops of the black bean sauce. Both woks were then lubricated with some water whilst I spent a couple of minutes cooking the noodles. As the food went on to the table I was told there were not enough noodles to keep everyone happy. The complainant was right. Mostly you cook noodles (rice or pasta) and they grow as they cook so the scant handful thrown into boiling water turns into too much to eat. These noodles shrank as they cooked. We had a go cooking some and still there weren’t enough. They were very good though!